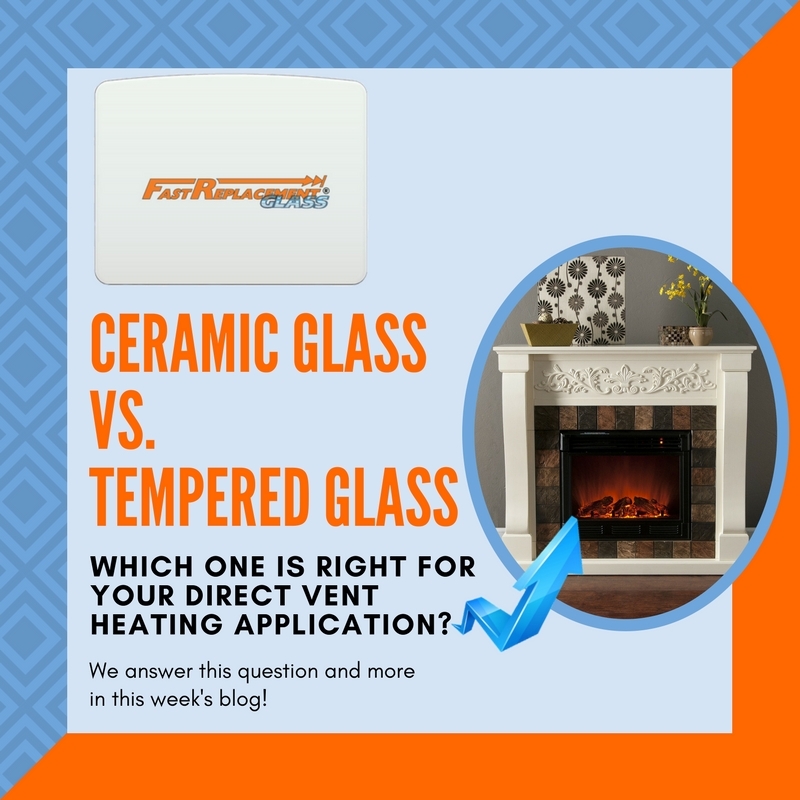 Ceramic Glass vs. Tempered Glass: Which Is Right For Direct Vent Heating Applications? Have a direct vent fireplace or gas stove but not sure which replacement glass window you need? We're here to help you figure out which one is best for your heating application! When it comes to a high temperature glass window, you want the ultimate in strength, quality, and dependability. You also want to make sure you are getting the correct replacement glass for your direct vent application! Depending on the type of heating application you have, the glass choice can be critical to the operation of your stove or fireplace. Let's explore the difference between the styles of direct vent heating, as well as the difference between glass and ceramic, to figure out what you will need for your replacement window! Direct vent applications are versatile and efficient, and can be installed virtually anywhere in your home! They emit no fumes into the home, which makes these applications perfect for those who suffer from allergies or asthma. With the help of a sealed 2-pipe ventilation system that is installed horizontally through a single wall or vertically through the roof, these applications can be situated almost anywhere in your home. The cool air that is used for combustion enters through the outer pipe. It is heated and directed into your home via the sealed radiant glass front. The inner pipe then routes 100% of the exhaust fumes back outside. Direct vent stoves burn fuel at a 70% efficiency rate, creating a greater comfort level for your home while using less natural gas or propane. These low maintenance heating options offer the realism of a wood-burning fire without all the upkeep! 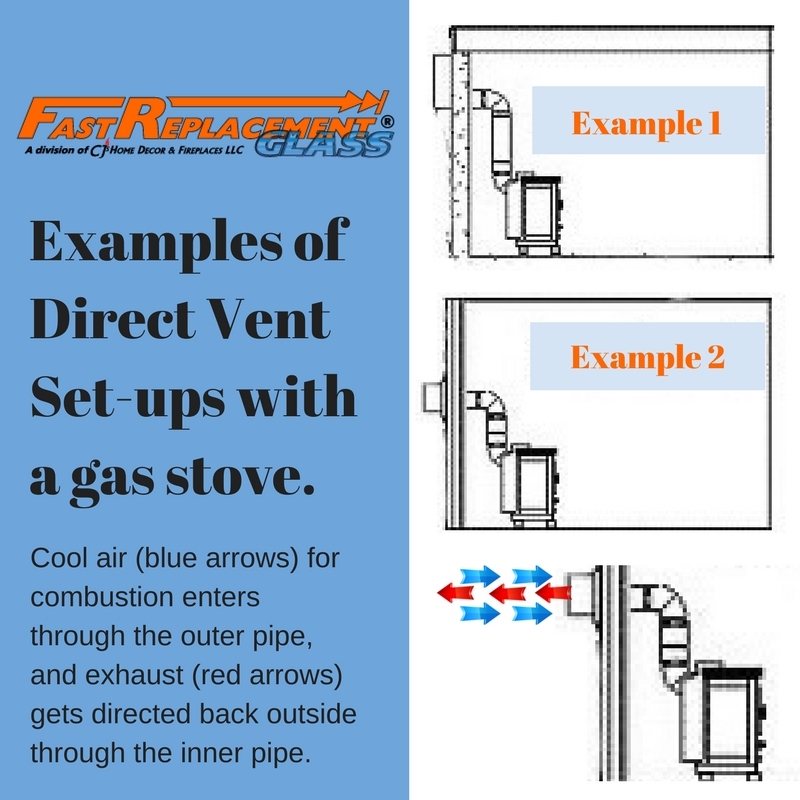 Regular direct vent fireplaces operate with a lower BTU output and are capable of providing heat to the immediate area of the room in which they reside. Regular direct vent fireplaces must be operated with a TEMPERED glass front. The Annual Fuel Utilization Efficiency rating is used with direct vent fireplaces that cycle on and off to maintain a consistent temperature. They typically have a secondary heat exchanger and circulating fans to deliver warmth to your home. These particular applications are capable of delivering more BTUs than a regular direct vent model; therefore, they are capable of providing heat to multiple rooms in your home. AFUE-rated direct vent fireplaces require CERAMIC replacement glass. These easy to operate applications deliver a lower BTU output and are only capable of providing heat to the room in which they are installed. Regular direct vent gas stoves must be operated with a TEMPERED glass front. The Annual Fuel Utilization Efficiency rating is used with applications that run at periodic intervals to maintain an even temperature. They are able to produce a higher BTU output than regular direct vent models. They usually have circulating fans to help deliver heat for your home, and are capable of providing warmth to multiple rooms. AFUE-rated direct vent gas stoves require a CERAMIC glass window. What makes our glass stand out above the rest? Our tempered glass is up to 7 times stronger than regular glass, ensuring a durable and safe product! It has a thermal shock rating of 400°F, making it an excellent replacement choice for the glass window on your regular direct vent application. Tempered glass sheets are available in 3/16", 1/8", or 1/4" thickness. 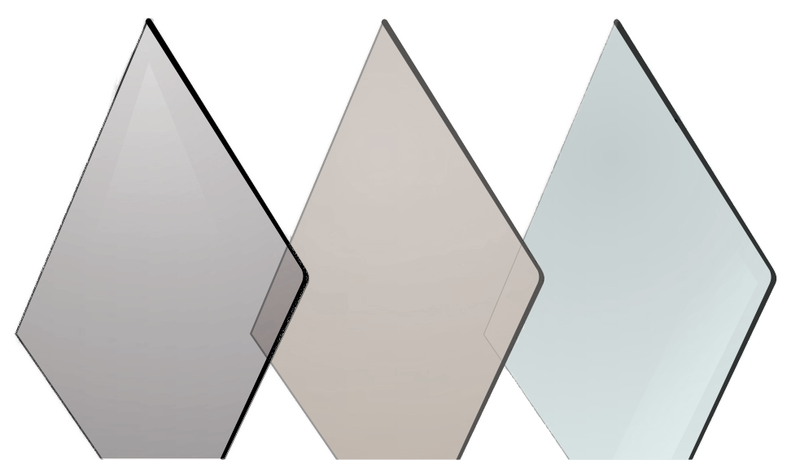 Your replacement glass window is available with clear, gray, or bronze tints (see right for approximate color variations). The thermal shock rating of our ceramic replacement glass 1380°F, which is ideal for AFUE-rated applications. We offer 3/16" thick, amber tinted pyroceram in many shapes and sizes. 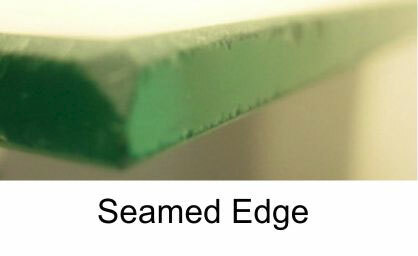 All of our glass has a seamed edge finish, which has been lightly sanded to smooth off any sharp areas. Upgrade finishes are also available with certain glass window cuts. Glass expands when heated! Please request your cut of glass to be at least 1/8" shy of the mounting surface to allow for a safe thermal expansion. Metal screws and mounting hardware also expand when exposed to high temperatures! To avoid damage to the glass when your appliance is in use, please make sure you are not over-tightening the included hardware. Fast Replacement Glass cannot be held responsible for damage to glass windows due to improper measurements or hardware that has been secured too firmly. We are always available to answer any questions you may have about your replacement glass window when you call 1-888-986-1535! Last updated on September 18th 2017.